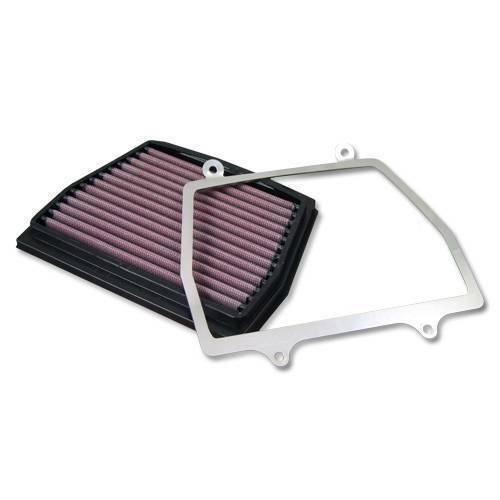 This Stage 2 Air filter & Cover features DNA's advanced FCd (Full Contour design). Installation of this DNA S2 Air filter & Cover is very easy, simply follow the installation instructions included by DNA. The flow of this DNA Air Box Cover & Fcd Air filter is very high, 127.29 % more than the APRILIA stock air box flow! DNA Stage 2 air box cover and filter flow: 152.90 CFM (Cubic feet per minute) @1,5"H2O corrected @ 25degrees Celsius. Aprilia stock air box intake: 67.27 CFM (Cubic feet per minute) @1,5"H2O corrected @ 25degrees Celsius. This DNA S2 application is designed to increase the Power & Torque of the Dorsoduro 1200 and can be used for road and track use. This application includes the DNA Stage 2 filter and the inox bracket!